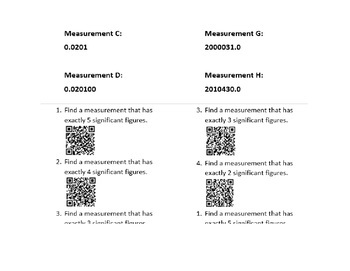 Have your students walk around the room and look at eight measurements. Can they identify the measurement with 3 sig figs? When they've figured out the answer, they scan a QR code to confirm. Don't like QR codes? You can have students turn in their answers instead. To lengthen the activity, there are 4 questions distributed among students. Have them trade questions and repeat the process until they have solve all four questions! This is a quick activity that gets kids moving around the room! Sig figs can be so tedious - why not wake 'em up?! This product comes with teacher instructions, 8 measurement, and 4 different student questions. They are all in WORD format and can be easily edited.